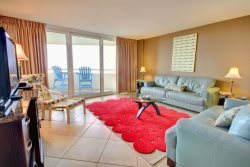 Vacation in a beautiful, luxury condominium located in an exquisite beach front setting. Indigo covers 7 tropically landscaped acres on the snowy white beaches and gorgeous blue waters of the Gulf of Mexico. The spacious 2004 SF floor plan has a large fully equipped kitchen and bar area featuring granite counter tops. Master Suite with walk-in closet and expansive bath area with separate shower and jetted bathtub. The Living Room and Master Bedroom open on to a large beach front balcony. Other features include a Den with a Queen sofa sleeper, a half bath and a private elevator entry directly to your unit. Travertine throughout Foyer, Living Room, Dining, Kitchen, Den and Bedrooms are carpeted. Electronics include Flat Screen TV, DVD, VCR, Stereo in Living Room and TV's in all Bedrooms. This was the sixth year we have rented the Indigo units from you. We have always had a great experience with every one of your staff members we have spoken with. We will be booking next year's vacation with you soon! We can't say enough good things about the Indigo property and both of the units. The property is always very clean and well kept. Our family looks forward to coming every year! Hold your own private viewing party in the 12 seat theater on property, complete with private bathroom.